Proper packing is an essential aspect of every well organised removal. Packing though is such a hassle at times especially when there are quite a few, or odd items which need securing prior to transit. Another issue is having to purchase the right size and amount of packing and wrapping materials as it is not uncommon to underestimate how much and what is needed to pack and wrap everything properly. Nevertheless, packing cannot be bypassed and must be done well. 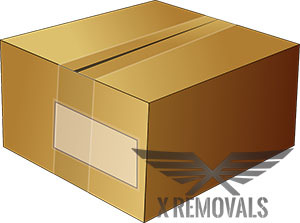 As always, X Removals has matters covered – we offer professional packing services in London, and specialised delivery of packing boxes, both of which are affordable, ensure proper protection of goods during handling and transit, and save you lots of time and hassles. On request we will deliver the necessary number and size of high durability/high strength moving boxes to a customer specified address. If necessary we can do this in advance of the actual removal day so that people can take their time and do their own sorting and packing of items. If at any stage the need for more boxes arises, please let us know and we will organise for those to be delivered as soon as possible to your home or office. Alternatively, we can bring a pre-set number of moving boxes of the right size on removal day and do the packing for you. Usually packing requires more than just boxes as not all items can fit in boxes. For such occasions we have our specialised packing materials delivery in London – an excellent service that saves you time, effort and money. There will be no need to go anywhere or buy anything as we will deliver a full kit of the required type and quantity of packing and wrapping supplies to your doorstep at the right price. Again, we can do this in advance of actual moving day so you take your time and do your own packing of items, or we can arrive earlier on removal day, along with the materials, and help you do the packing – quickly, safely and efficiently. All packing materials and moving boxes are high quality products, delivering the necessary strength and durability. We work with trusted manufacturers and suppliers so that our customers get the most for their money. Please let us know of any special packing requirements or considerations so that we arrange for the correct materials to be available at the requested time and day.